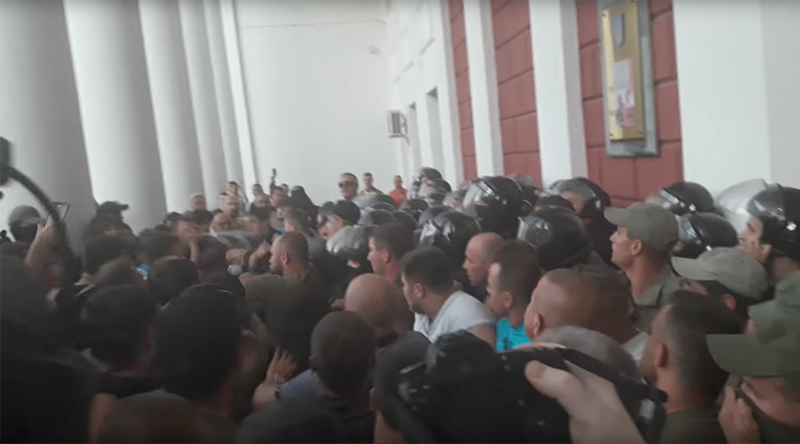 Angry parents have clashed with police outside the Odessa City Hall over the deaths of three girls who perished in Friday night’s fire at a children’s camp. Firefighters discovered a number of fire safety violations at the leisure resort while officials insist “fire safety standards” were adhered to. Police used tear gas to disperse the raging crowd of around 200 activists and victims’ parents who are demanding answers from the mayor over fire safety violations that hampered firefighters’ rescue efforts Friday night. At around 5:00pm local time, the angry crowd attempted to storm the building but were pushed back by riot police. An hour later, they again attempted to breach police lines but were stopped by tear gas. By nightfall, some of the parents and activists set up tents, still demanding to see Odessa's mayor Gennady Trukhanov or his deputy Zinaida Tsvirinko. Earlier in the day, the mayor said everything was up to fire safety standard at Victoria camp. However, the version of events by firefighters at the scene contradicts Trukhanov’s claims. They said putting out the fire at the three-story wooden structure Friday night was extremely difficult as there were no emergency water sources on the territory of the children’s facility. There was a fire hydrant, but the pressure was weak. The fire reservoir did not have enough water and that access to it was blocked, firefighters said. The rescue crew found a water supply only some 1,200 meters from the campus. It took firefighters over two hours to extinguish the flames that were also threatening nearby wooden cottages. Three girls aged 8,9 and 12, all reportedly living in the same room, lost their lives in the tragedy. Another two children were injured. Children were awakened by the smoke in the dormitory which housed 42 children, according to eyewitness reports. 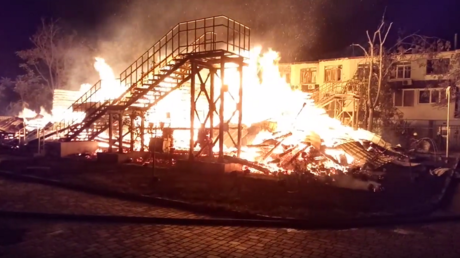 On Saturday morning, Mikhail Vovka, from the Federal State Dispatch Service for Odessa region, told reporters the management of the camp had terminated their contract with a fire safety monitoring company. Therefore, when the fire started, no alarm was sounded. “In 2016, a modern fire alarm was purchased, installed and put into operation in the camp, but then it was deliberately brought to a non-operational state,” Vovka said, according to the Odessa Life portal. Mayor Trukhanov, however, told journalists that all structures at the 2.7-hectare campus had functioning alarms. He further claimed that the wooden structures were coated with a special fire-resistant spray. The Prime Minister of Ukraine Volodymyr Groysman and the Governor of Odessa region, Maksim Stepanov, have condemned the tragedy, vowing to bring those found negligent to justice. A few people have already lost their jobs following the tragedy. The director of the camp, Petros Sarkisyan, and his deputy have both been sacked, according to reports. In addition, Sarkisyan and another camp official who was responsible for fire safety at the Victoria camp have been detained. The head of the regional administration in Odessa, Vladimir Sushkov, has also been reportedly dismissed. The head of Odessa's Department of Education, Elena Buinevich, has submitted her resignation letter.